Spring is here! 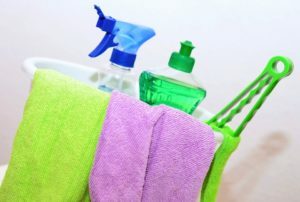 The days are getting longer, giving you more time to give your home a nice spring cleaning. Whether you clean your entire house once a month, or once a year, renting a self storage unit can help you immensely. Not only will you get things out of the way while you’re cleaning, it’s a great place to store seasonal items and free up space in your home. To make sure you don’t waste time cleaning the same things twice, clean from top to bottom and left to right. Start with ceiling fans, light fixtures and corners. Then wipe down walls, windows, counters, tables and floors. Before you wash your tables, cabinets, counters and shelves be sure to remove everything first. Dust and wipe down knick-knacks and books. This is also a great time to go through those stacks of bills and papers. Take the time to toss what you don’t need and file what you do. Don’t forget about all those hidden places underneath furniture and appliances. Pull them out and wash the floors and walls around them. If you’re planning on painting a room or shampooing your carpets, consider moving all your furniture into a self-storage unit. This will make it easier to clean and make sure you don’t get paint all over your furniture. Take your mattresses outside and lay them on a tarp in the sun for a few hours. Some strong UV light can help get right of microscopic creature that are trying to take up residence there. A thorough steam cleaning will also leave your furniture feeling and smelling fresh. As you’re cleaning you may find that some items in your home need repair – leaky faucets, broken door handles, cracked tiles, etc. Take the time now to make these repairs to prevent them from becoming more serious and causing costly problems later. You can then place the tools you don’t use frequently in a self-storage unit. Sweep the corners, wash air vents, wipe down trim and molding, and clean out the dirt from the tracks of your windows and doors. Use a pressure washer to remove grime. Remove wasp and spider webs from exterior walls and windows. While you’re at it, spray down the garage floor and scrub it will a coarse push broom to get right of spills and grime that you could track in and stain your freshly cleaned carpet. Trim bushes, aerate the lawn, lay down fresh mulch, and maybe even plant a few flowers. Spring cleaning is certainly a lot of work, but the payoff is worth it. You’ll have a cleaner, safer home to enjoy. Don’t forget to use your self-storage unit to keep all of the clutter from making its way back into your home.